Cover: R. M. Mally . Vol. 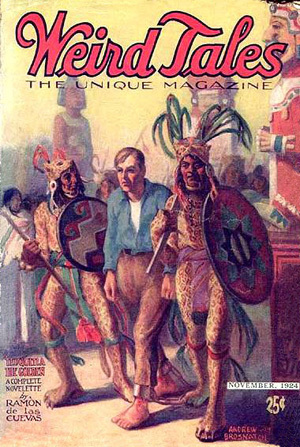 III, Number 1 issue for January, 1924 of the classic pulp magazine, “Weird Tales”. Famed as the magazine showcasing the works of Edgar Allan Poe, H.P. 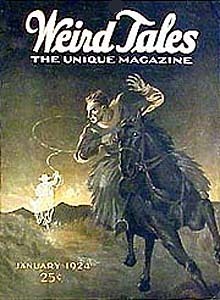 Lovecraft and Robert E. Howard, this 96pp large format (9” x 12”) issue’s cover shows a cowboy on a run-away horse being pursued by a ghostly phantom rider spinning a lariat. The issue contains the H.P. Lovecraft story, “The Picture in the House”; other stories included are: “The Abysmal Horror” by B. Wallis, “Black Sorcery” by Paul Annixter; “The Hand of Fatma” by Harry Anabl Kniffin, “The Man Who Banished Himself” by Ferdinand Berthoud; “A Game of Chance” by Henry Lieferant and Sylvia B. Saltzberg; “The Open Window” by Frank Owen; “The Cat Called Carlos” by H. F. Leslie; “The Picture in the House” by H.P. Lovecraft; a continuing installment of “Draconda” by John Martin Leahy; “The Hook of Death” by Mrs. Harry Pugh Smith; “The Monstrosity” by George W. Crane; “The Cobra Lily” by Ledyard M. Bailey; Weird Crimes No. 3. “The Magic Mirror Murders” by Seabury Quinn; Masterpieces of Weird Fiction No. 5. “The Black Cat” by Edgar Allan Poe; The Eyrie letters to the editors section. April, 1924, Vol. 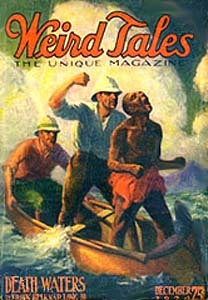 3, #4 issue of “Weird Tales”. 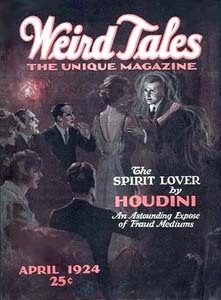 From the time period before “Weird Tales” went to the smaller digest size, this 96 page issue measures 9” x 12” with a terror-ific cover for the lead story “The Spirit Lover - An Astounding Expose of Fraud Mediums” by Houdini (pages 3-5). There is also the concluding installment of Houdini’s spiritualistic expose “The Spirit Fakers of Hermannstadt” (pages 52-56) plus the question/answer “Ask Houdini” column (pages 86-88) with letters answered by Houdini. Other major contributors to the issue include H.P Lovecraft (with both “The White Ape” (page 15-18) and the poem “Nemesis” (page 78)) and Seabury Quinn (“Weird Crimes - No. 5 Mary Blandy” (pages 80-84)). Vol. III, Number 3 for March, 1924 of the classic pulp magazine, “Weird Tales”. Famed as the magazine showcasing the works of Edgar Allan Poe, H.P. 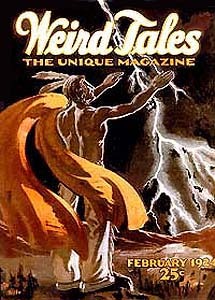 Lovecraft and Robert E. Howard, this 96pp large format (9” x 12”) issue’s cover story is the 4 page story entitled “The Spirit Fakers of Hermannstadt - An Amazing Adventure of Houdini” by Harry Houdini and subtitled on the cover “The Most Miraculous True Story Ever Written”. The stunning cover is designed to look like the famous pose of Houdini in chains. 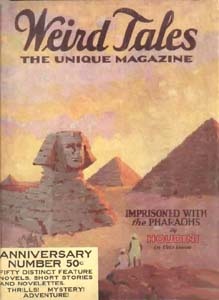 The issue also contains one of the most well-known Lovecraft stories, “The Rats in the Walls” and an “Ask Houdini” section where, to quote directly: “Houdini, Master of Escape, authority on the subject of spiritualistic and psyhic phenomena and creator of the weird and mysterious, will answer through the columns of this magazine any rational question that is deemed of general interest to our readers....”. 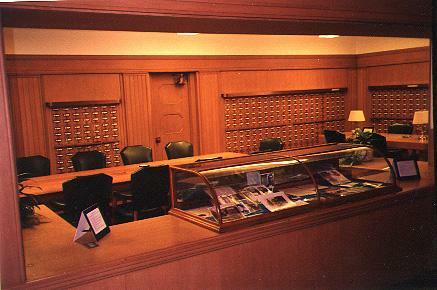 A listing of other stories included are: “The Hermit of Ghost Mountain” by C. Franklin Miller, “Justice in the Foothills” by Clement White, “Zillah” by Valma Clark, “Hunger” poem by Leonard Fohn, “The Fine Art of Suicide” by Howard Rockey, “Ashes” by C. M. Eddy, Jr., “The Rats in the Walls” by H.P. Lovecraft, “The Voice of Euphemia: A Strange Tale of the Spirit World” by Eudora Ramsay Richardson, “Yellow and White” by George Fuller (thumb-sized stain on page), second installment of Sybla Ramus’ weird novel of mysterious India, “Coils of Darkness”, “The Toad” by Donovan G. Fitzpatrick, “The Statement of Archibald Swayne” by Burton Peter Thom, second installment of “The Transparent Ghost” by Isa-Belle Manzer, a continuing installment of “Draconda” by John Martin Leahy, “Creatures of the Night” by A. P. McMahon, “The House in the Forest” by Harold Ward, Masterpieces of Weird Fiction No. 6. “Never Bet the Devil Your Head - A Tale with a Moral” by Edgar Allan Poe, and finally The Eyrie - ‘Ask Houdini’ question/answer section. With Weapons of Stone..........C. M. Eddy, Jr. Copyright © 1998, 2002 Miskatonic University Press / yankeeclassic.com, all rights reserved . . .